Smooth Fitness was started back in 1984 as a fitness retailer in Philadelphia. They grew into a manufacturer of treadmills and elliptical trainers, and became one of the first successful online retailers during the early internet days, in the late 1990s. As recently as December of 2014, all of the trademarks and websites were purchased by ICON Health & Fitness, the biggest name in the fitness equipment industry and manufacturers of the popular NordicTrack and ProForm brands, as well as Weider, Reebok, Weslo and Healthrider, among others. Our experience with Smooth has been particularly entertaining. Compared to other brands that focus on residential products, Smooth seems to put a lot of effort in adding something different with every model they launch. For example, on some models they include the Motion control feature that allows you to change speed just by waving your hand over the handle bars sensors. Their entertainment signature used to be the My Smooth Virtual Fitness Trainer. This interactive system improved the workout diversity. Since they are now a part of ICON Fitness, this has been replaced with the newest iFit technology. Smooth pays close attention to the motors they incorporate in their treadmills. You receive only continuous duty motors, which means they can sustain intense power for a long time during regular use. Smooth offers a strong warranty for each model, no matter the price. Even with a $900 model (such as Smooth 800) you receive a lifetime warranty for frame and motor, 5 years warranty for parts and electronics, and 2 years labor warranty. This feature is available only on some treadmills, but it is an excellent component as you have control to adjust the treadmills’ resistance to your personal weight and the training intensity you desire. Smooth builds heavy-duty treadmills, and that is why it is difficult to move or assemble them. Even if it costs more, it is worth purchasing the extra Delivery & Assembly option to have the machine delivered and assembled by their team.UPDATE: Many models now incorporate SpaceSaver design and easy folding technology. Smooth sells only online and you can’t test the product before you buy it. 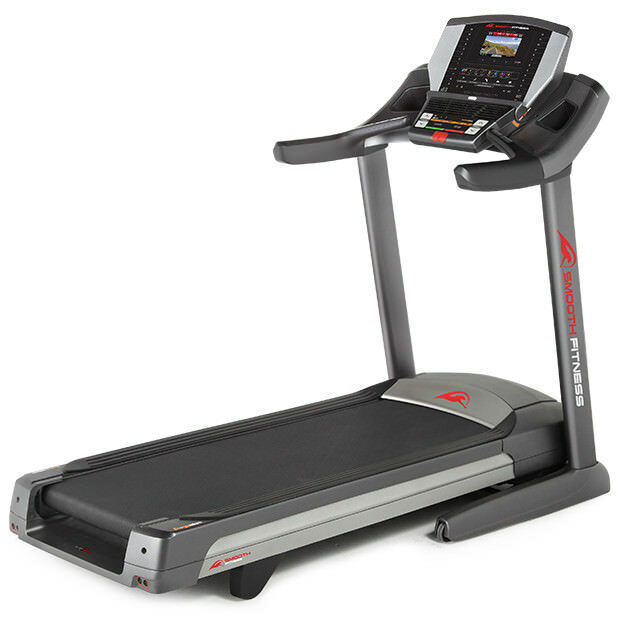 Smooth treadmills used to receive many awards and accolades from consumer magazines as well as top industry experts. The entry level models are fine for walking and jogging, and even some light running. So these should suffice for most of you. If you are a very serious runner then consider the higher end models as they are more rugged and durable, and offer better cushioning systems and motors. It boils down to what your needs are, so choose wisely. **UPDATE** We no longer recommend Smooth treadmills as it appears that ICON Fitness no longer focuses on this brand. There are far better choices from their sister brand NordicTrack, so we would definitely look there before choosing a Smooth Fitness machine. iFIT s – Which Machines Have This Technology?